Backyard landscaping has paved the way to budget-friendly and space-efficient type of landscaping. Gone were the days when the backyard is just that extra space for old bulky items, forgotten science experiments, and long-overdue DIY plant boxes. A good backyard landscape design will turn that forgotten and usually hidden part of the house into the pride of the town. 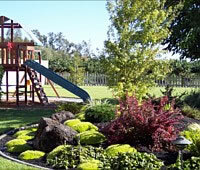 In our over 40 years of combined landscaping experience in California, we have seen the ugliest backyard landscaping ideas and have also worked with the best ones. Trust us when we say that Design West Landscaping knows how to recreate the ugly place into a peaceful paradise. It's wise to use all the space you have for entertainment. The backyard can be the full-pledged party hang-out with friends. 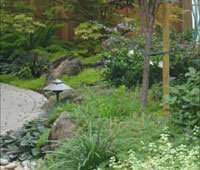 It can also be transformed into a heavenly, peaceful space for your regular meditation with a landscape garden design. Add a small swimming pool or a dedicated spa or Jacuzzi in the backyard and you'll have a relaxing way to enjoy the weekend with friends or family. Love to cook? There are backyard landscaping designs that can recreate the forgotten space into an outdoor kitchen and BBQ. If you just love a good sight, our backyard landscaping design can turn the totally abandoned space into an attractive and colorful spot. If all you want is a space for a good chat, then a patio will be perfect in the landscape designs for backyard. 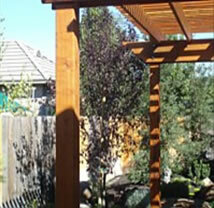 A pergola or gazebo is also a good idea. Or if possible, have a backyard deck and enjoy the beauty of your surroundings. Better yet, have two or maybe all of these outdoor living spaces right in your backyard. It just takes a wise backyard landscape design to have it all or at least, have some of it. Any plans of transforming your backyard into anything you've been dreaming of is only possible with garden landscape designs that should be followed with construction and maintenance. Our team of landscaping experts designs a backyard based on the current condition of the area and the owner's preferences. We visit the place and talk with the owner before starting the landscape garden designs. This way, we sure can come up with backyard landscape ideas that will fit the area while ensuring that it will be very flattering. Want to have landscaping stone or even landscape rocks? No problem! We can have these delivered anywhere in San Joaquin Valley and East Bay area. We definitely know where to put fieldstones, flagstones, beach rocks, pebbles, and even mountain boulders in the backyard landscape. Landscaping stones are perfect for retaining walls, walkways, ponds and waterfalls and as an accent to the topiaries and flowering plants. Sometimes masonry works is needed to make these landscaping stone or landscape rocks become a durable structure in your landscape. The finishing touches in your backyard landscape will be complete after adding plants, furniture pieces, artworks, and more. There sure are more landscaping ideas for backyard. But the final result will just be the same- a surprising transformation. With great landscaping ideas, backyard metamorphosis is possible. Since there are endless possible backyard landscaping designs to choose from it will be difficult to choose on your own. Let professionals do the job and save you from frustration. Our team can create the best design for your backyard so you don't have to do anything but to enjoy the newly built backyard landscaping.